Author(s) Robert M. Kacmarek PhD RRT FAARC Kacmarek, Robert M.
A leader in respiratory care education for more than 40 years, Egan's Fundamentals of Respiratory Care, 10th Edition delivers a comprehensive introduction to the field of respiratory care and keeps you up-to-date on the latest advances and trends in professional practice today. 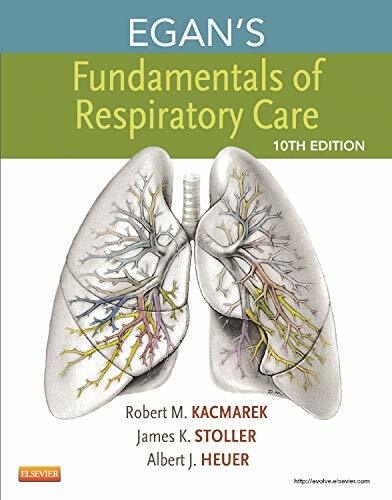 With this new edition, you'll gain a thorough understanding of the role of respiratory therapists (RTs), scientific bases for treatment, and clinical applications. In-depth discussions progress from the principles of respiratory care to applied anatomy and physiology, assessment, discussion of specific respiratory illnesses, basic therapy, acute and critical care, and preventive and long-term care. Egan's is the most recommended and trusted text for NBRC examination preparation. UNIQUE! Egan's trusted reputation as the preeminent fundamental respiratory care textbook delivers comprehensive coverage while keeping you up to date with this ever-changing profession. UNIQUE! Expert authorship from the leading figures in respiratory care ensures critical content is covered thoroughly and accurately. UNIQUE! Mini Clinis give you an opportunity to apply text content to actual patient care through short, critical-thinking vignettes. UNIQUE! Rules of Thumb highlight rules, formulas, and key points that are important to clinical practice. Excerpts of all 49 published Clinical Practice Guidelines provide you with important information regarding indications/contraindications, hazards and complications, assessment of need, and assessment of outcome and monitoring. Therapist Driven Protocols (TDPs) used by RTs in hospitals to assess patients, initiate care, and evaluate outcomes, are incorporated throughout the text to demonstrate the value of following an established protocol. Learning Objectives highlight key content at the beginning and at the end of each chapter in a bulleted section and parallel the three areas tested on the NBRC exam: recall, analysis, and application.Updated content aligned with the 2009 NBRC CRT Summary Content Outline ensures the text is both current and clinically accurate.Expanded use of the NBRC Exam Matrix Correlation Chart throughout all Evolve online resources makes test preparation easier.